Question 1. Which of the following correctly describes the magnetic field near a long straight wire? (a) The field consists of straight lines perpendicular to the wire. (b) The field consists of straight lines parallel to the wire. (c) The field consists of radial lines originating from the wire. (d) The field consists of concentric circles centred on the wire. Answer. (d) The field consists of concentric circles centred on the wire. (a) the process of charging a body. (b) the process of generating magnetic field due to a current passing through a coil. (c) producing induced current in a coil due to relative motion between a magnet and the coil. (d) the process of rotating a coil of an electric motor. Answer. (c) producing induced current in a coil due to relative motion between a magnet and the coil. Answer. (d) AC generator has slip rings while the DC generator has a commutator. Question 6. State whether the following statements are true or false. Question 7. List three methods of producing magnetic fields. (i) A natural magnet or bar magnet produces magnetic fields around it. (iii) Current passing through A a solenoid, generates uniform and strong magnetic fields inside the solenoid. Question 8. How does a solenoid behave like a magnet? Can you determine the north and south poles of a current–carrying solenoid with the help of a bar magnet? Explain. Answer. A coil of many circular turns of insulated copper wire wrapped closely in the shape of a cylinder is called a solenoid.In fact, one end of the solenoid behaves as a magnetic north pole, while the other behaves as the south pole. The field lines inside the solenoid are in the form of parallel straight lines. This indicates that the magnetic field is the same at all points inside the solenoid. That is, the field is uniform inside the solenoid. Question 9. When is the force experienced by a current–carrying conductor placed in a magnetic field largest? So, F, the force will be maximum if Θ = 900 as sin 900 = 1 is the maximum value of sin Θ. Question 10. Imagine that you are sitting in a chamber with your back to one wall. An electron beam, moving horizontally from back wall towards the front wall, is deflected by a strong magnetic field to your right side. What is the direction of magnetic field? Answer. The direction of magnetic field will be at right angles to the direction of plain of moving beam and direction of force acting on it. Question 11. 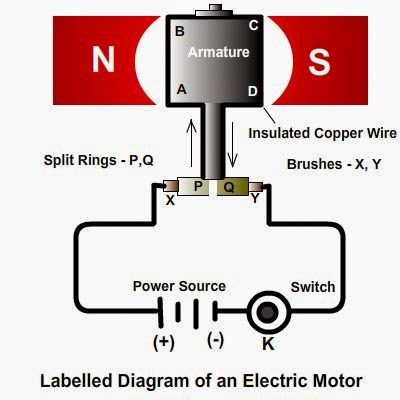 Draw a labelled diagram of an electric motor. Explain its principle and working. What is the function of a split ring in an electric motor? Working : An electric motor, as shown in Fig., consists of a rectangular coil ABCD of insulated copper wire. The coil is placed between the two poles of a magnetic field such that the arm AB and CD are perpendicular to the direction of the magnetic field. The ends of the coil are connected to the two halves P and Q of a split ring. The inner sides of these halves are insulated and attached to an axle. The external conducting edges of P and Q touch two conducting stationary brushes X and Y, respectively, as shown in the Fig. Current in the coil ABCD enters from the source battery through conducting brush X and flows back to the battery through brush Y. Notice that the current in arm AB of the coil flows from A to B. In arm CD it flows from C to D, that is, opposite to the direction of current through arm AB. 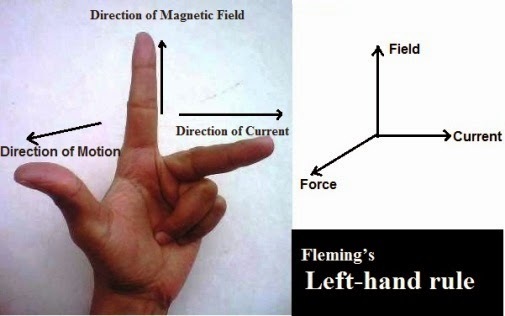 On applying Fleming’s left hand rule for the direction of force on a current-carrying conductor in a magnetic field (see Fig.). We find that the force acting on arm AB pushes it downwards while the force acting on arm CD pushes it upwards. Thus the coil and the axle O, mounted free to turn about an axis, rotate anti-clockwise. At half rotation, Q makes contact with the brush X and P with brush Y. Therefore the current in the coil gets reversed and flows along the path DCBA. A device that reverses the direction of flow of current through a circuit is called a commutator. In electric motors, the split ring acts as a commutator. The reversal of current also reverses the direction of force acting on the two arms AB and CD. Thus the arm AB of the coil that was earlier pushed down is now pushed up and the arm CD previously pushed up is now pushed down. Therefore the coil and the axle rotate half a turn more in the same direction. The reversing of the current is repeated at each half rotation, giving rise to a continuous rotation of the coil and to the axle. Question 13. A coil of insulated copper wire is connected to a galvanometer. What will happen if a bar magnet is (i) pushed into the coil, (ii) withdrawn from inside the coil, (iii) held stationary inside the coil? Answer. When a coil of insulated copper wire is connected to a galvanometer, its needle may undergo deflection showing presence of current, only if there is an induced current in the coil. (i) When a bar magnet is pushed into the coil, due to gradual and relative change in the strength of magnetic field, a current will be induced in the coil, which will cause the deflection in the galvanometer. (ii) When a bar magnet is withdrawn from inside the coil, agin, due to gradual and relative change in the strength of magnetic field, a current will be induced in the coil, which will cause the deflection in the galvanometer but now in opposite direction. (iii) When a bar magnet is held stationary inside the coil, there will be no gradual and relative change in the strength of magnetic field, hence no current will be induced in the coil. We will observe no deflection in galvanometer. Question 14. Two circular coils A and B are placed closed to each other. If the current in the coil A is changed, will some current be induced in the coil B? Give reason. Answer. We know, when a coil is placed in a region where the magnetic field changes with time, there is the production of induced current in the coil due to phenomenon of electromagnetic induction. If the coil is placed near to a current-carrying conductor, the magnetic field may change either due to a change in the current through the conductor or due to the relative motion between the coil and conductor. Here, when the the current in the coil A is changed, its corresponding magnetic field will also undergo change in its strength. As coil B is placed closed to coil A, an induced current will be produced in the coil B also. Question 15. State the rule to determine the direction of a (i) magnetic field produced around a straight conductor-carrying current, (ii) force experienced by a current-carrying straight conductor placed in a magnetic field which is perpendicular to it, and (iii) current induced in a coil due to its rotation in a magnetic field. Case 1 : The direction of a magnetic field produced around a straight conductor-carrying current is given by the right-hand thumb rule. According to this rule, when we hold a current-carrying straight conductor in our right hand such that the thumb points towards the direction of current. Then direction of our fingers wrapped around the conductor points to direction of the field lines of the magnetic field. 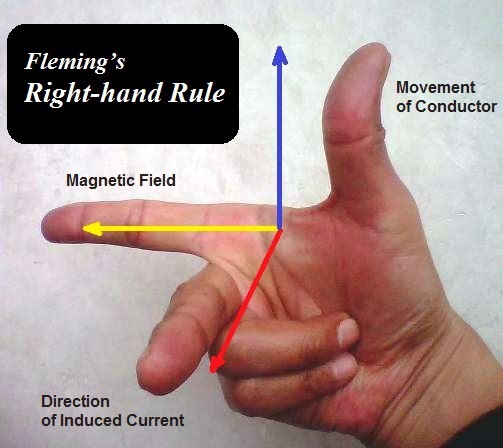 Case II : The direction of a force experienced by a current-carrying straight conductor placed in a magnetic field which is perpendicular to it, is given by Fleming’s left-hand rule. According to this rule, stretch the thumb, forefinger and middle finger of your left hand such that they are mutually perpendicular. If the first finger points in the direction of magnetic field and the second finger in the direction of current, then the thumb will point in the direction of motion or the force acting on the conductor. According to this rule, Stretch the thumb, forefinger and middle finger of right hand so that they are perpendicular to each other, as shown in Fig. 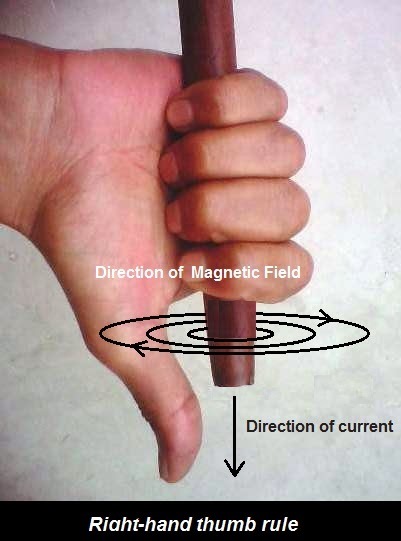 If the forefinger indicates the direction of the magnetic field and the thumb shows the direction of motion of conductor, then the middle finger will show the direction of induced current. Question 16. 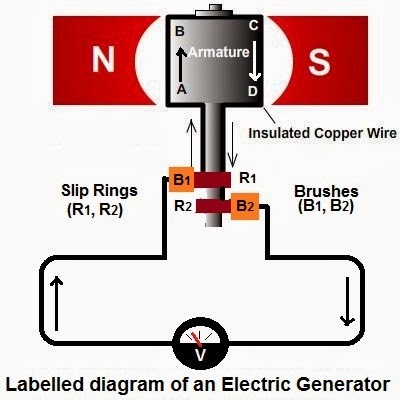 Explain the underlying principle and working of an electric generator by drawing a labelled diagram. What is the function of brushes? Answer. Principle : An electric generator converts mechanical energy into electrical energy. The working principle of electric generator is based on the phenomenon of electromagnetic induction. According to which, when a coil or conductor is placed in a changing magnetic field, a induced current is produced in the coil. In an electric generator, mechanical energy is used to rotate a coil or conductor in magnetic field. Due to the relative motion of the coil inside a magnetic field of magnet, the coil or conductor is subjected to continuous changing magnetic field, hence there is a production of induced current in the coil. The direction of the induced current is given by the Fleming’s right-hand rule. Construction : An electric generator, as shown in Fig., consists of a rotating rectangular coil ABCD as an armature placed between the two poles of a permanent magnet. The two ends of this coil are connected to the two metallic slip rings R1 and R2, which are mounted seperately on one end of the axle of rotating coil. The inner side of these rings, are made insulated, so that these are not in contact with either the axle or with each other. The two brushes B1 and B2, which are made of soft conducting material such as carbon, are kept pressed separately on the outer surface of rings R1 and R2, respectively. Outer ends of the two brushes are connected to galvanometer through connecting wires to show the flow of current in the given external circuit. We can also connect an electric load in the external circuit. Working : In an electric generator, the armature coil ABCD is mechanically rotated from outside through its axle, inside the magnetic field to produce electricity. The slip rings R1 and R2, which are mounted separately on the axle of armature coil, are connected to two ends of armature coil ABCD and while in rotation, these rings are also in contact with outer stationary brushes B1 and B2. As the armature coil rotate clockwise in the arrangement shown in Fig, the arm AB moves up and the arm CD moves down sweeping across the magnetic field produced by the permanent magnet. The induced currents are set up in these arms along the directions AB and CD, according Fleming’s right-hand rule. Thus an induced current flows in the direction ABCD. As there are larger numbers of turns in the coil, the current generated in each turn adds up to give a large current through the coil. This means that the current in the external circuit flows from B2 to B1. After half a rotation, arm CD starts moving up and AB moving down. As a result, the directions of the induced currents in both the arms change, giving rise to the net induced current in the direction DCBA. The current in the external circuit now flows from B1 to B2. Thus after every half rotation the polarity of the current in the respective arms changes. Such a current, which changes direction after equal intervals of time, is called an alternating current (abbreviated as AC). And electric generator producing an alternating current is called an AC generator. Function of Brushes : The two fixed brushes B1 and B2, which are made of soft conducting material such as carbon, are in contact separately with the outer surface of rotating rings R1 and R2, respectively. These brushes dynamically connect the electric load in the external circuit with induced current in armature coil through its ends for output power. Question 17. When does an electric short circuit occur? Answer. An electric circuit consist of live wire (or positive) usually with red insulation cover and neutral wire (or negative) with black insulation. In some situation, when the wire insulation is either damaged or there is some fault in the appliance, the live wire and the neutral wire may come into direct contact. This results in a very large amount of current passing through the circuit resulting in occurrence of a short circuit. Question 18. What is the function of an earth wire? Why is it necessary to earth metallic appliances? Answer. Connecting the metal case of an electric appliance to a metal plate deep in the earth near the building by means of a metal wire is called earthing. It is used as a safety measure specially for those appliances which have a metallic body. The metallic body is connected to the earth wire which provides a low resistance conducting path for the current. Thus, if there is any leakage of the current to the metallic body of the appliance, the user is protected from any severe shock.